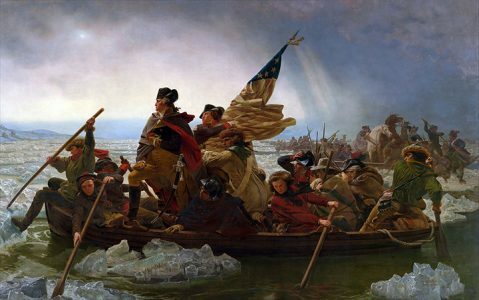 242 years ago, today, December 26, 1776, General George Washington and his army crossed the howling, ice-covered, Delaware River and in the Battle of Trenton, New Jersey, defeated the Hessian mercenaries hired by the British. Washington’s audacious action saved the American Revolution. Washington was facing a British Army, which was well clothed, and well-equipped, while his army was still in their summer uniforms, many without shoes and short of supplies. His army as well as the colonists were demoralized because of the many defeats and desertions. The Second Continental Congress retreated from New York to Philadelphia. Many colonists had serious doubts about winning the war. Nevertheless, Washington fought on. In his surprise attack that morning, Washington’s forces captured 1,000 prisoners and seized much-need munitions. 22 Hessians were killed and 98 wounded. Only three Americans were killed and six wounded. As you know, today, America is facing another crisis. We are a house divided. Our Nation’s religious and moral foundations are being destroyed by the Radical Left. And our national security is being threatened by Muslims waging a “stealth campaign” to destroy America from within.Many politicians pander to race and nationality for votes. As a result, America is caught-up in a tangle of squabbling special interest groups. The sacrifices of our Founding Fathers and patriots, like Washington’s army crossing of the Delaware, and the generations of patriotic Americans that followed them, gave us the gift of freedom. It’s up to you and me to make sure their sacrifices were not in vain. This is your moment in history. It is our turn to preserve for future generations the gift of a free nation based on the Judeo-Christian values on which it was founded. Your past generous financial support has helped the Thomas More Law Center become the “point of the spear” in the legal battles to maintain a strong and free America, and to restore and preserve our Nation’s Judeo-Christian heritage and moral values. So as 2018 draws to a close, please consider making another sacrifice—a special year-end, tax-deductible gift to the Thomas More Law Center. You must make your donation by December 31, 2018, for it to be deductible on your 2018 Federal tax return. If you have already given your year-end donation, thank you. If you make a donation on-line, it must be made by December 31, 2018, in order for it to qualify as a tax deduction on your 2018 Federal tax return. If you mail in a donation, the envelope must be postmarked by December 31, 2018.